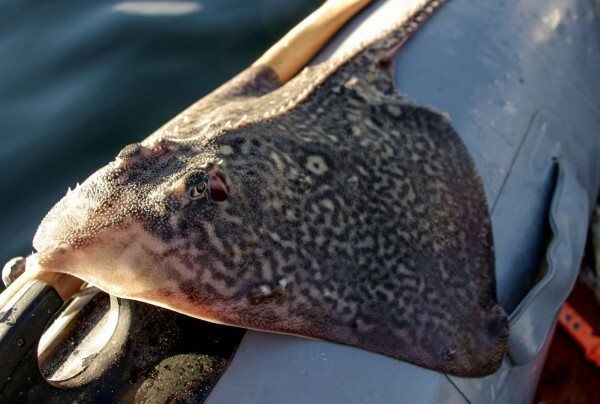 An excellent mark for rays, from both shore and dinghies, Leven is a small, sheltered sea loch that can produce some quality fish. It’s one of a few areas where I’d say that fishing has actually improved in recent times. The video below gives a flavour of what’s available. 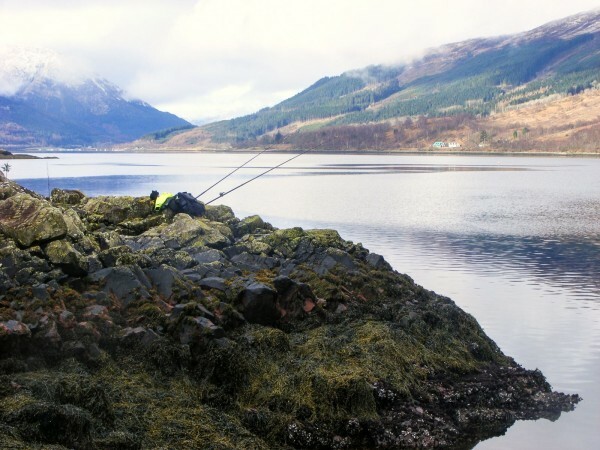 I first fished Loch Leven a few times around the year 2000, but moved on after experiencing very poor fishing – supposedly the loch was commercially fished for a while, which decimated the ray population. Whether this was true or not I don’t know, but I left it alone for many years and only decided to try it again after a run of poor fishing on Etive. This resulted in an excellent day’s ray fishing, with over 30 caught on my rod, and put Leven firmly back my personal angling map. 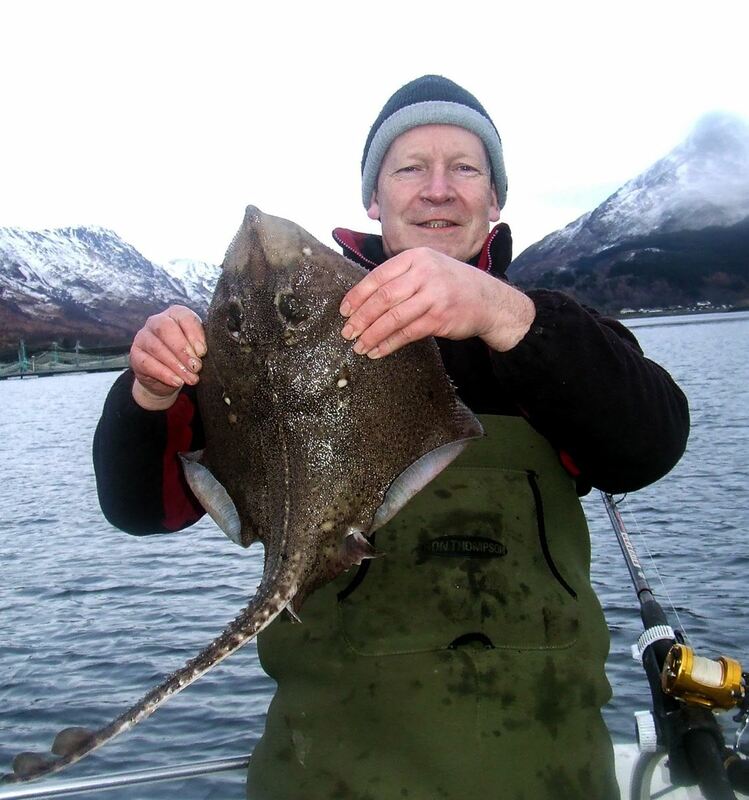 Leven is smaller and shallower than either Sunart or Etive, and is mainly a thornback ray venue. That’s a bit of a grand generalisation as plenty of other fish get caught there too, but it’s been my main experience of the loch. 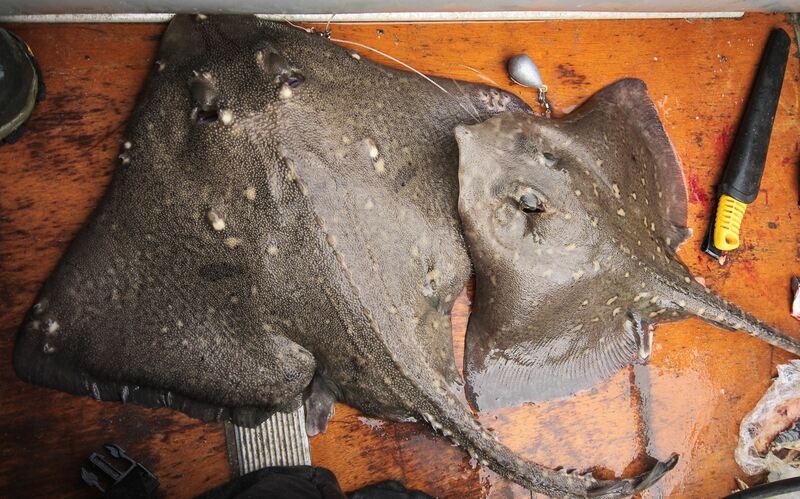 Some of the rays are of a good size, into low double figures, and some very good conger have also been taken. It can also (fairly) reliably produce small numbers of mackerel during the winter months. 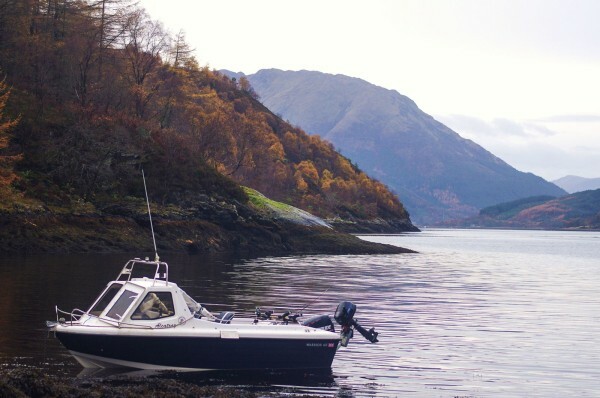 The main launch site for boats is down near the Isles of Glencoe hotel, where there is a rough grass access track to a steep slate beach at the far end of the car park. There is a car park barrier in place, but you can get the key from the watersports centre or from the hotel reception (pretty much 24 hours a day I think). The access track is fairly steep and can be muddy, so a 4WD is probably essential. I’ve had most success fishing across the loch near the large fish farm (watch the anchor chains though), but there are several spots up the loch which have done well for me too. Tide is rarely a problem except down nearer the mouth where it can run very quickly in places. 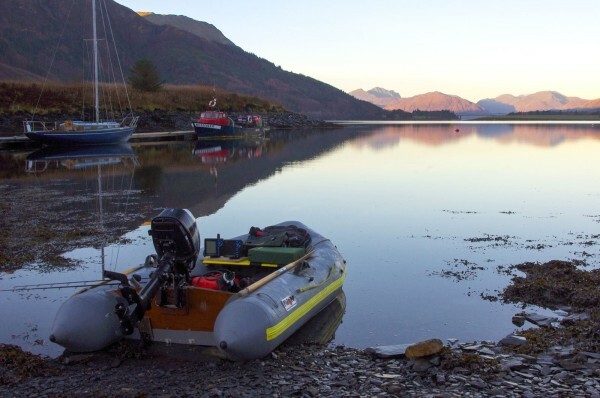 I’ve frequently fished Leven from an inflatable and it’s a pretty good venue for this style of fishing (or for kayaking), being small, sheltered and not too deep when it comes to hauling up an anchor. Shore access is generally good – plenty of anglers fish from the steep slate banks east and west of the hotel, into around 80-90 feet of water, but I prefer some of the less popular marks well up the loch. The north bank is easily accessible for most of its length and several spots will provide good shorefishing for rays and dogfish. 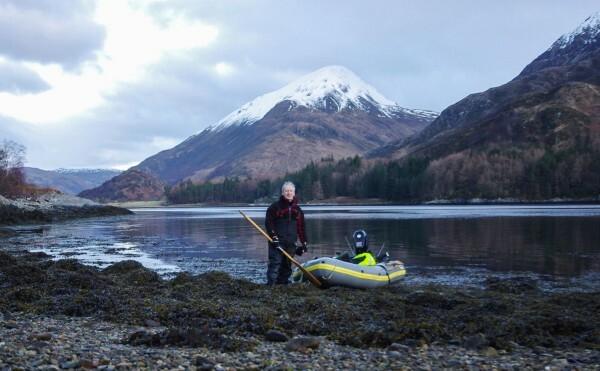 It can be difficult to scramble down the steep slopes of the south bank between Ballachulish and Kinlochleven (and dangerous in places), but there is access to deepish water and some decent ray fishing. Close in can produce codling, smallish Pollack, etc. 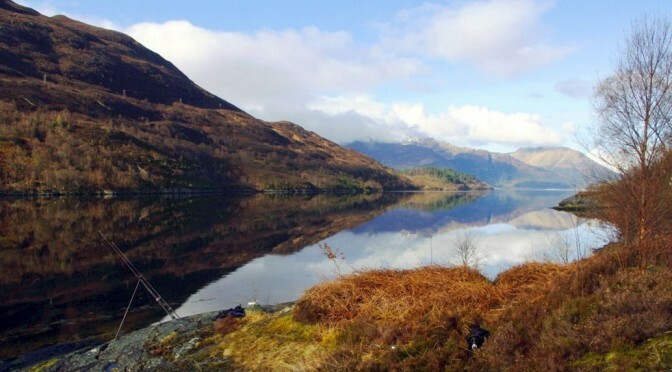 Personally I fish Leven mainly during the winter months, but that’s mainly because there is better fishing to be had elsewhere during the summer, and because I get driven beyond distraction by midges in the warmer months. Being sheltered and 2.5 hours or so from Edinburgh it does make a fairly easy venue to visit in quieter spells of winter weather, and the scenery can be hard to beat. For shore fishing I usually use a pulley rig with a 3/0 or 4/0 baited with mackerel and attached to a 6oz grip. Most of the loch is fairly snag free, although you regularly get snarled up in the thick seaweed around the margins. 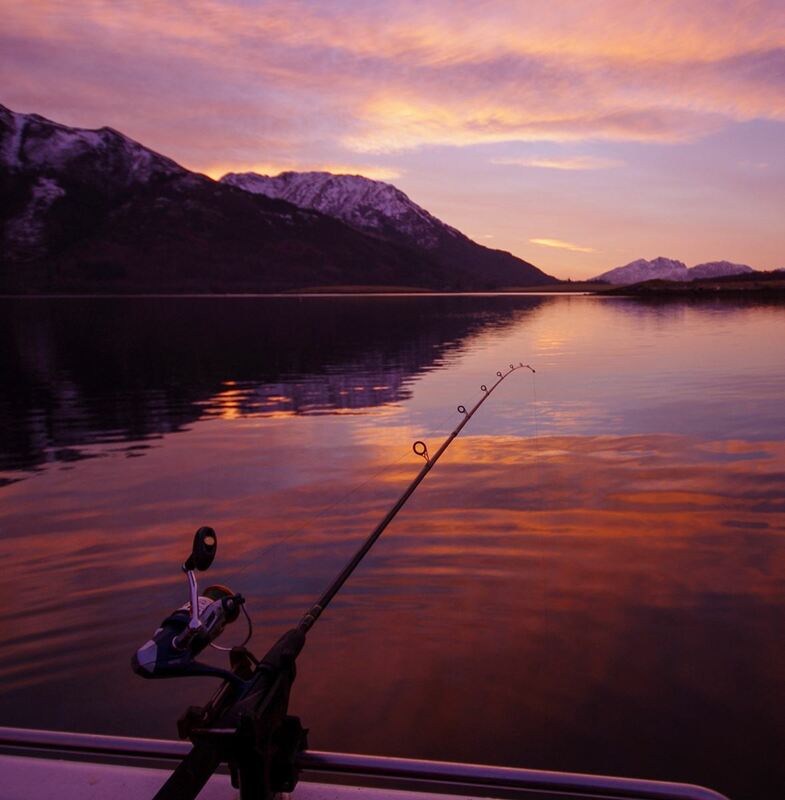 Boat fishing is usually a running ledger with a 6 or 8oz lead, although you can easily use a spinning rod in many places. For the most part Leven is shallower than Etive, and you usually end up in 70-100 feet, although there are some deeper parts. Leven can fish pretty well for thornbacks and doggies at that time of year, plus whiting, codling, etc. I even had a mackerel last year from the shore near the fish farm opposite Ballachulish. Three areas to think about would be the slate heaps around the Isles of Glencoe Hotel, casting towards the islands just offshore; the area just to the west of the fishfarm opposite Ballachulish; or several spots well up the loch on the north side between the small cemetery near the holiday chalets at Callert and the Narrows near Kinlochleven. All get you into 80-100 feet of water with a modest cast, and I normally just use a mackerel strip with a 6oz grip. Be very careful on the rocks in the last two areas – they are extremely slippery when wet. i started fishing loch leven waaay back in 1970 with a bit of stick , 12′ long ,a 12 ‘ length of line , two “penny” hooks from Barr Stores , now the Quarriers Kitchen , and some sheep’s wool taken from the fence in the Crochan . the idea was you whipped the wool onto the hook rather like mackerel feathers , attached the line to the pole ,then just like a fly cast you tied your hooks ,the set up was called a darrow . various colours could be made by dyeing the wool , onion skins gave you an orangy/yellow , blaeberries gave you purple . the idea was that you and another person would row over the reefs and the pole was put vertically down in the water so the line would drag 12′ behind the boat and about 10’ down . when you got hits you reversed the hands ,up came the fish, hit off your chest ,and landed in the boat , a quick hand reversal and you were fishing again . on a decent evening you and your mate would catch six/seven dozen fish ,a mixture of “cuddys” and “lythe” and if you were lucky a couple of drams in the Ferry . it sounds a lot but by the time the catch was divided up to the family, nothing was wasted , incidently a typical mid day meal when the quarry was going was a plate of porridge and a cuddy . Hi Corkwing, just after a bit of advice. I have fished Loch Leven a few times from the south shore, rays, pollack and codling. I will be taking a couple of my young volunteers (18 yrs, young by my standards!) fishing soon, we won’t be getting to the area until after 7pm, I am torn between finding a slot on the north shore, or perhaps the Ballachulish Hotel. Is this the hotel by that slatey harbour just south west of the group of wee islands? The hotel you’re thinking of is the Glencoe Isles Hotel – the Ballachulish Hotel is right beside the bridge at the mouth of the loch, on the south side just on the Oban road. Fishing-wise it can be a bit of a toss-up between south and north shore. The slate marks are easy to access and safe, and give a reasonable range of fishing. 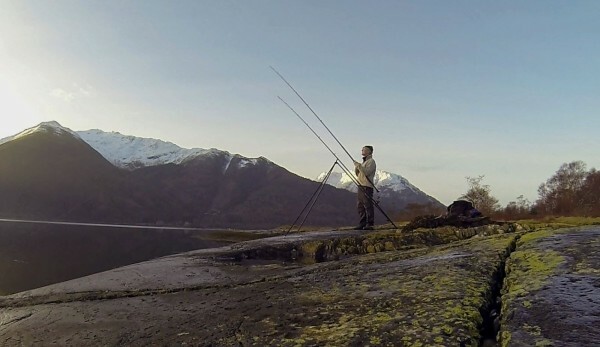 I like to fish the north shore (the area just immediately west of the fish farm can be good, as can several places well up the loch – drive up past the cemetery until you find a decent sized layby on the loch side of the road, then try off the rocks there). However, a lot of the rocks can be very slippery indeed as they’re worn smooth by the ice, so quite a lot of care needed and I wouldn’t choose to do a night session here unless you’ve been in daylight. Being a wimp, I tend to choose south or north bank largely on which gives the most shelter from the wind, etc. You’re other option might be to try at either of the slipways at the mouth of the loch – drop a bait in to see there are conger about. Not sure about this time of year, but later in the year there are some decent fish caught. I find that Leven can be quite a dour place at times, and even from the boat it can switch off for hours at a time, so it is a little random as to what you can catch on a given day. Hi, I am just getting into fishing and have tried Loch etive 3 times with no success. I would really love to catch a Ray, I’m just looking for a bit of advice on the best place to go. I have read your posts referring to the Loch being good in the winter. Do you think it would be worth a go this time of year? I’m trying to find somewhere that I could have a nice day out or would evenings and nights be a better time to visit. I would be fishing from the shoreline. Any advice would be much appreciated. The lochs fish year round, but I tend to target other locations (east coast, Galloway) over the summer and there is also the midge problem to contend with. Keep the gear simple – mackerel strip on a 3/0 or 4/0 hook using a pulley rig will do all you need it to. I generally use a 6 or 7oz grip lead and 80 or 100lb mono to help protect against spurdogs. Tides don’t matter that much, although I prefer a bit of movement. Water depth not that important either in the summer, although I’d prefer over 30 feet. Very deep water tends to be hard work, although rays are quite comfortable with it. Soft mud to sand on the seabed matters. 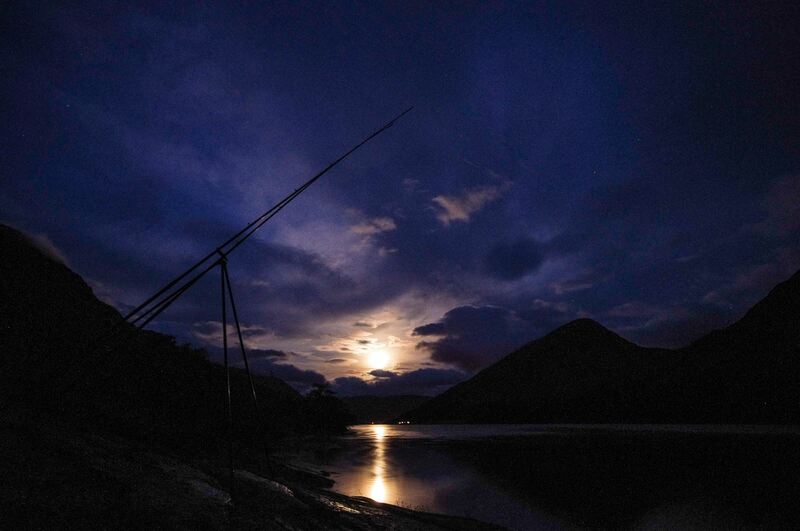 I ‘m not much of a night fisherman, but the dusk and dawn periods at this time of year would be my favourites – but you’ll need a light breeze or be eaten alive by the bugs. Weather makes no difference to the fish but greatly affects how well you can fish – a gale in your face makes life much, much more difficult and I’d change mark if I found myself in that position. Leven is my favourite for rays, but I do OK on Etive and it gives a good chance of spurdog as well. 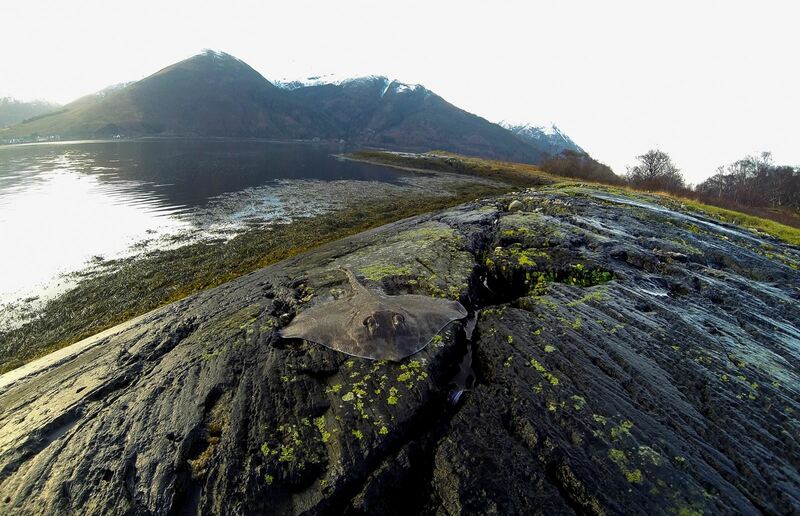 Linnhe produces good bags of ray too, although it’s not one I tend to fish myself. You do need to give them time to fish though and it can sometimes take several hours to get fish feeding. Do change baits every 30 minutes or so, and have a spare rig made up so that you take advantage when the fish do come on. I’d be inclined to try the north bank of Leven as there are several good spots between the fish farm opposite Ballachulish and the Narrows; Loch Etive on the north bank up from the quarry (have to hike here, and it’s deeper water and more like spurry territory) or possibly Linnhe, opposite Fort William near the bend round into Loch Eil. is there any access to loch with my boat without a 4×4,? I launch at the Isles of Glencoe hotel at Ballachulish, but you really need 4WD unless your boat is very light. Apart from that, your choices are limited. There are two old ferry slips down by the bridge. One is owned by the sea safari company at Ballachulish but you may be able to agree access (probably at a price). The other is on the north bank just beside the hotel. As far as I know it is still usable, although there are strong tide runs at times and you probably want two people to launch. It’s also fairly steep, so it depends a bit on the size of your boat/towcar as well. The campsite at Glencoe village/Invercoe also has a slip, although you may need to be staying there to use it. 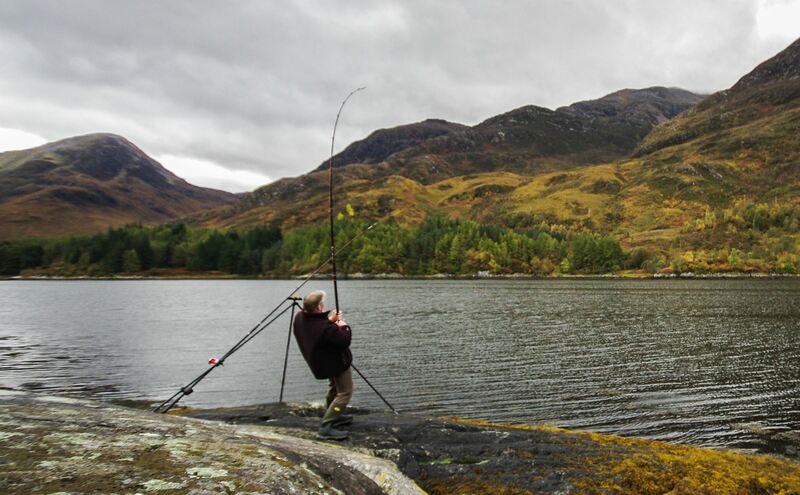 The campsite at Caolasnacon also has access, but probably only 4WD – however there are quite a few anglers use it, so you may be able to get some help. Other than that there is a slip near Kinlochleven, right at the head of the loch, but I’ve never been down to it and couldn’t say whether it’s still usable. 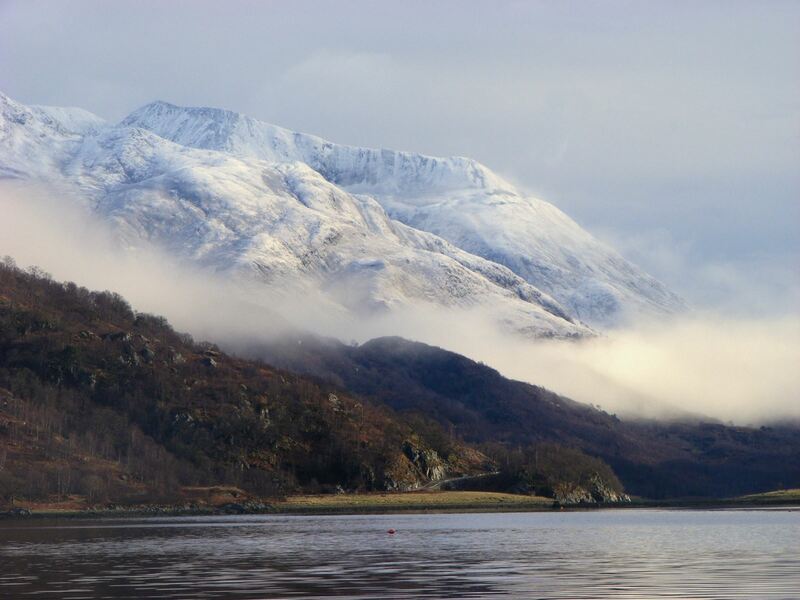 If you timed it for when the ferries aren’t running you could probably use the slip at Corran, which is 5-6 miles from Ballachulish bridge. Just don’t be tempted to cut the corner going round from Loch Linnhe to Loch Leven as there is a line of boulders runs just under the surface there! Personally I’d check the campsite at Glencoe as my first option.